Leigha married her fiancé Kenji in a beautiful barn adorned with crystal chandeliers. I blended rustic typographical elements with their champagne, warm gray and dusty pink wedding colors. 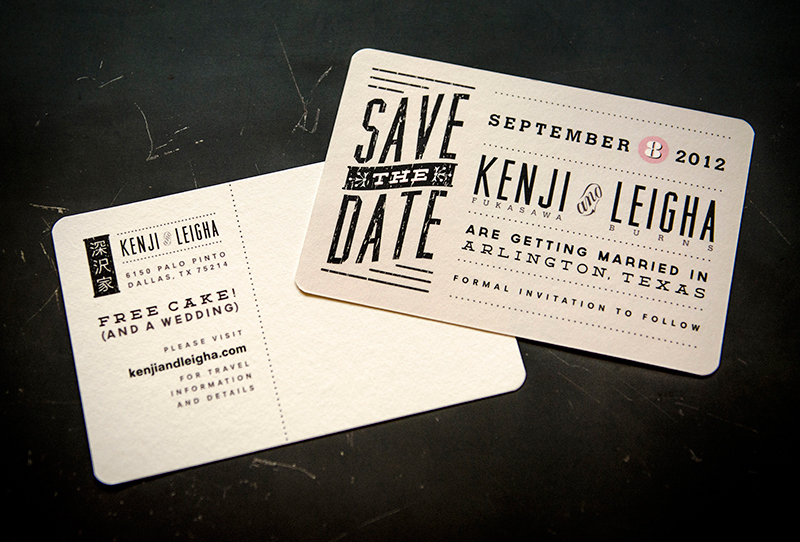 The suite included a custom-designed logo for the save the date and invitation, a return address rubber stamp incorporating Kenji’s family name in Japanese and a second rubber stamp of the logo so Leigha could stamp her own thank you notes. I photographed the couple for a 5x7 keepsake and a square rehearsal dinner invitation completed the package. My favorite piece was the “Free Ride” ticket, which surprised and delighted members of the wedding party with a free night’s hotel stay courtesy of Leigha’s parents. This clever piece featured perforated edges and punched corners to mimic a roll of raffle tickets numbered with the wedding date — little touches that made it extra special. I was honored to have this suite featured on one of my favorite paper blogs, Oh So Beautiful Paper.